If all the corners are sliced off a cube down to the midpoint of each edge, a spacial form will result which mathematicians call a cuboctahedron. Such a structure, with a centre and 12 corner points, was used in 1960 by the Optical Society of America in the design of their colour system. To be more exact, it was the Committee for Uniform Color Scales, founded in 1947 under the chairmanship of Deane B. Judd, which assumed the task and proposed this unusual geometry. 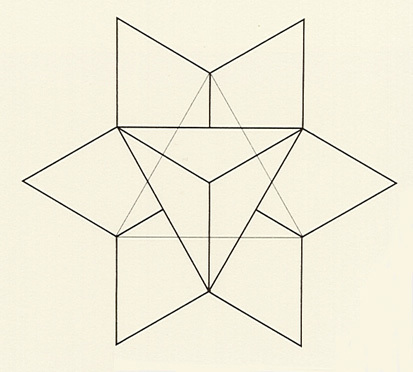 For this reason, the OSA-UCS system is sometimes also mentioned when referring to the regular lattice-work of a cuboctahedron. All corner points are marked alphabetically, and the centre becomes zero. 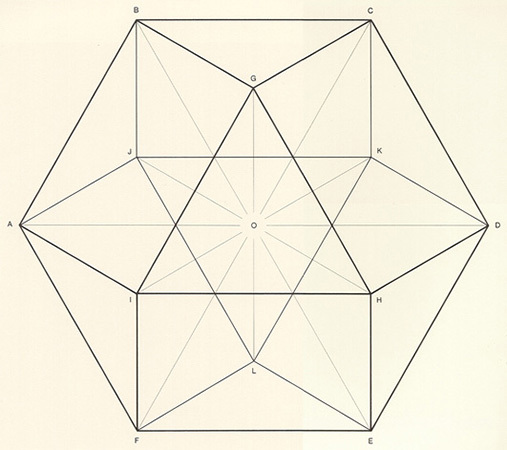 Such a structure introduces the possibility of allocating 12 immediate neighbours to the central point within its construction, as the small cuboctahedron shows. The OSA colour system is different from all systems introduced so far. We know that colours can be determined by three independent parameters. In the DIN system these are colour-hue, saturation and darkness; with the Munsell system they are chroma, hue and value. With all systems examined up to this point, a scale has been assigned to these parameters with has been created independently from all other variables. However, the colours of the cuboctahedron have been selected so that the distances between a colour-sample and each of its 12 nearest neighbours are dictated at each point of the lattice by a colour-difference perceived as uniform. If, therefore, we draw a line in each of the six directions determined by the lattice structure, we will produce graded scales for colour-difference. 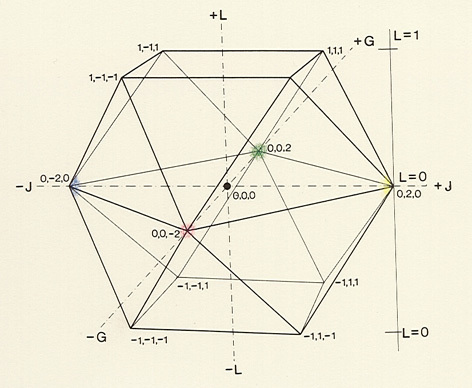 The position of a sample within this lattice is defined by the coordinates of three axes which intersect each other at right angles, stipulated by the UCS committee as being lightness (L), yellowness-blueness (J, abbreviated from the French «jaune») and greenness-redness (G). These unusual names should not be taken too precisely. The reference J represents yellow at a high lightness value (L) without, however, representing the yellow-blue axis. For negative values of J, the axis separates blue from the violet region. Correspondingly, the positive value for G will not indicate green; instead, this parameter separates the blue and green colours. And red does not lie at the end of the negative G scale, but pink. It is best to treat G and J as abstract parameters which, in the first instance, have nothing to do with colours. They were originally introduced to double as decimal numbers, enabling the positions of the colour samples to be defined. In the 1978 report issued by the Committee for Uniform Color Scales, a total of 558 samples were colorimetrically specified, together with their exact coordinates. The variable L (lightness) is of note for two reasons: not only is it specially constructed to incorporate chromatic and achromatic colours, but its value will also be zero when the brightness corresponds to the background generally recommended for viewing the samples. Positive values for L imply a colour which is brighter than the background, and negative values a colour which is darker. Since the remaining two parameters were intended to represent variables of opponent-colours, they will assume the zero point on the neutral axis. The centre of the figure to the above right possesses the trio of digits 0,0,0 and is furnished to correspond to the neutral grey of the Munsell scale (N5). The OSA-UCS system allows the scientist to analyse colour-differences and offers both designer and artist various colour harmonies, simply by extracting suitable sections from the colour-solid. Despite its fascination, many professionals evidently prefer a system which is less involved, and thus clearer. 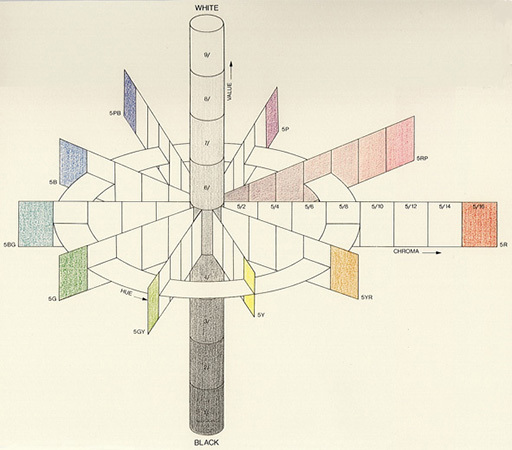 Date: This colour-system was commissioned by the Optical Society of America (OSA) and has been in existence since 1960. Application: Colour differences can be analysed: science, design, art. Bibliography: G. Wyszecki, «Farbsysteme», Göttingen 1960.